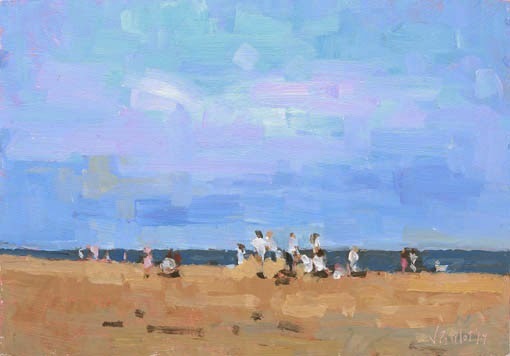 I just came back a few days ago from a fantastic painting trip in Norfolk. 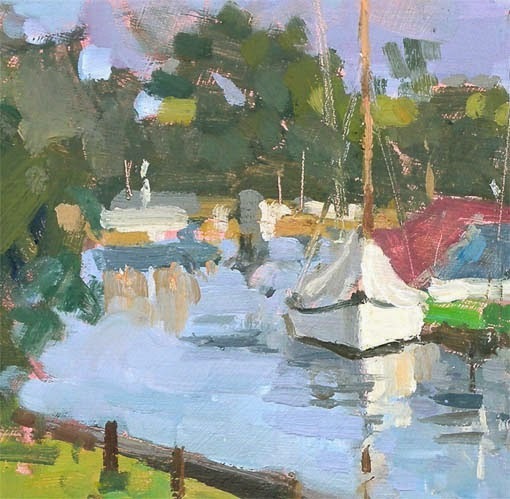 It was a 4 days plein air event/competition. Beautifully organised, lovely people, amazing landscapes and subject matters, and fantastic weather. And to make all this even better, I'm happy to announce I have won the first prize of the show alongside the first prize for the Norwich quick draw event. I couldn't be happier! 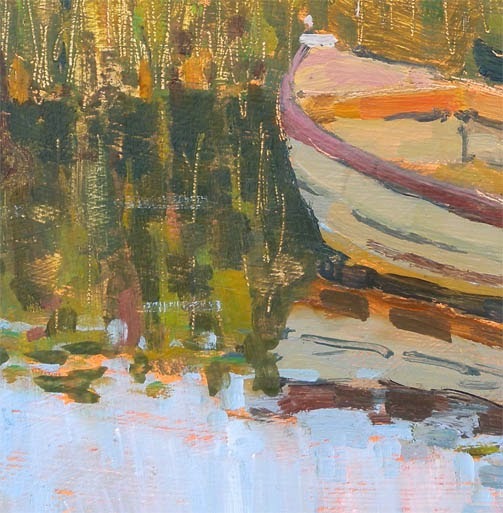 Here is below the painting that won the first prize. I really enjoyed painting this. I set up on the path leading to the pub and had a nice chat with people walking pass. The pub owner even brought me a nice cup of tea which helped me finish the painting. The late afternoon sun made some lovely reflections on the water. 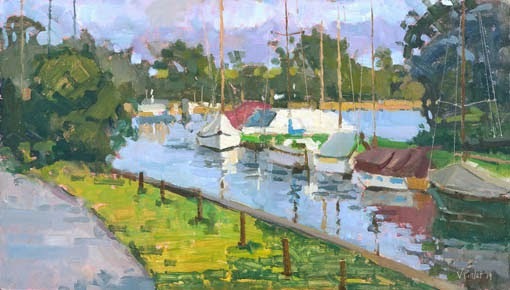 Below is a painting done close by in the morning. 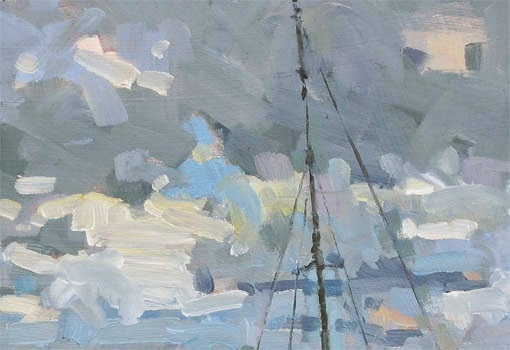 I had fun painting the sky and reflections on the water. 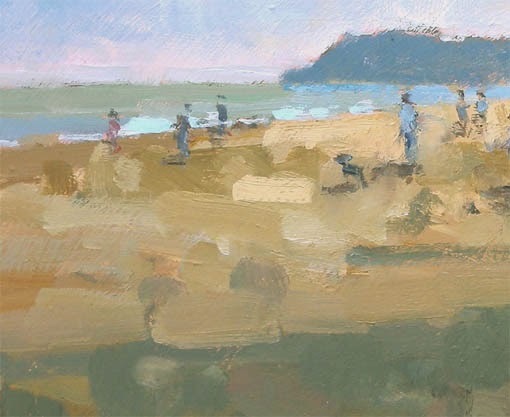 I discovered a lovely spot near Horsey one evening and started this little painting below. I could only paint 30 minutes until the end of the sunset so I came back the next day a bit earlier to finish it. 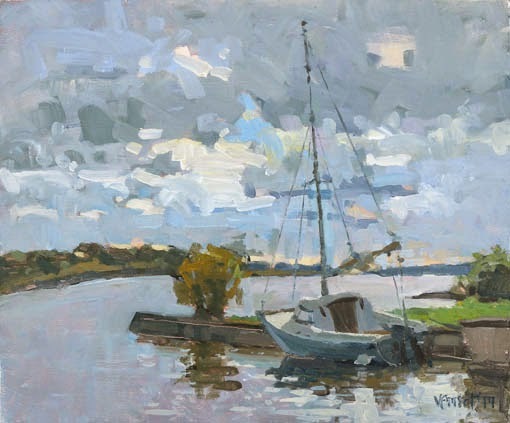 The place was beautiful and tranquil, which I have tried to convey in the painting. 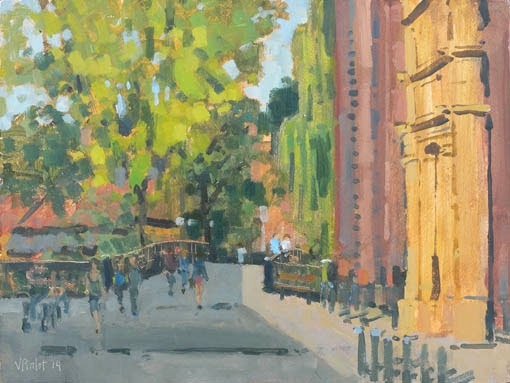 On the Sunday, there was the Norwich Quick draw competition, where all artists were required to produce a painting of the city of Norwich in two hours maximum. We all had to gather when the time was up to make sure nobody was going over the allowed time. The warm stone building of the Academy of Arts against the lovely greens caught my eyes. I'm happy to say I won the prize with the painting below. 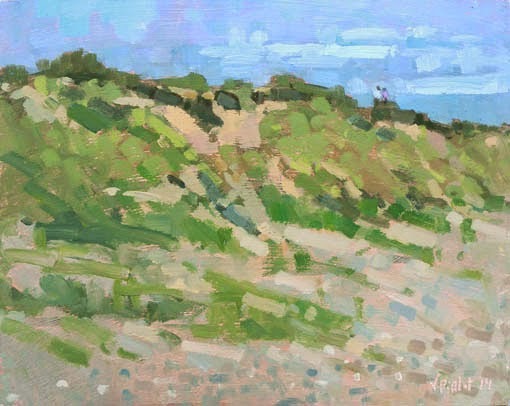 Below is a painting done in the countryside near Horsey. 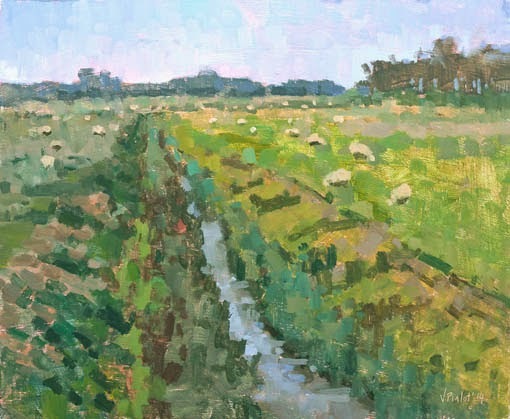 I was on my way there when I spotted this beautiful rural scene and felt the urge to paint it. 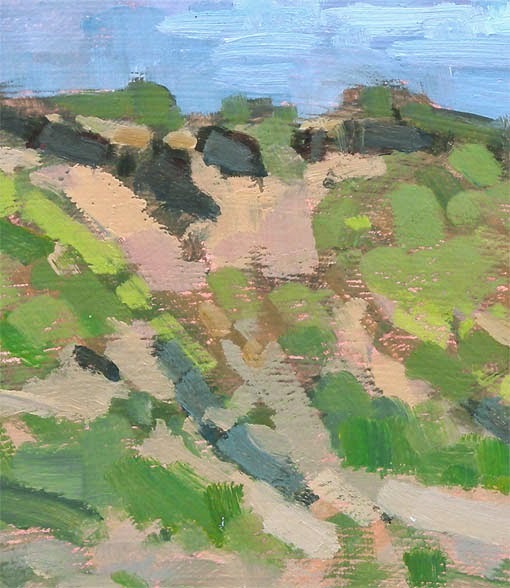 I love painting greens so this subject is really my cup of tea! 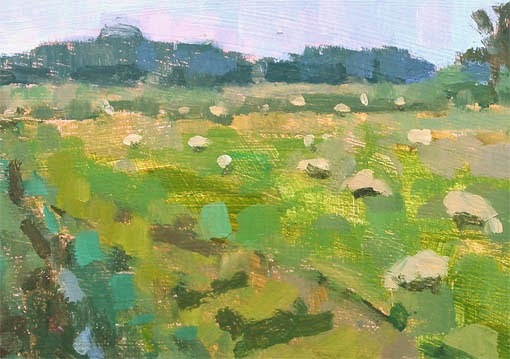 I painted the sheep as simply as possible so they would naturally merge into the background. 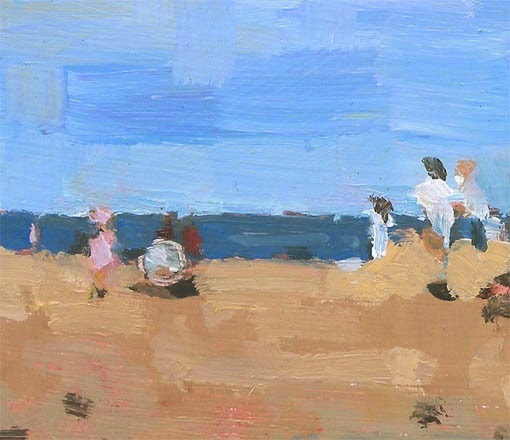 After the boats and the sheep, I decided to head to Winterton beach, a beautiful sandy beach where Seago has painted masterpieces. What a beautiful place. 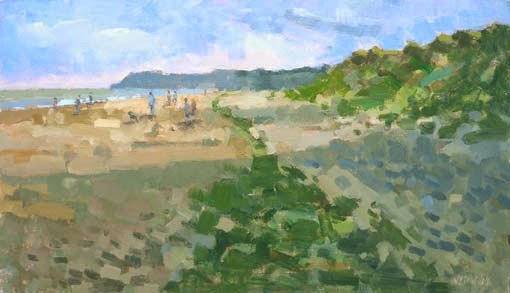 I painted three paintings there; one long view of the beach and sea, one study of the dunes, and a little study of a group of people wearing white tshirts building a sandcastle. Finally, here are four of my paintings framed ready for the show on Monday night. I couldn't stay for the show as I was needed back home for baby duty, but I got the phone call on that evening to let me know I won the prize! 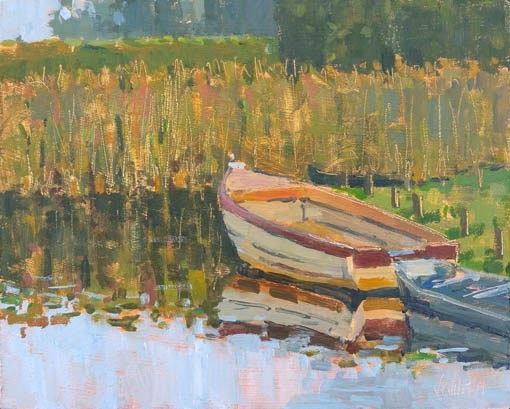 I would recommend to any plein air painter to register to next year's event ('A brush with the Broads' www.abrushwiththebroads.co.uk). 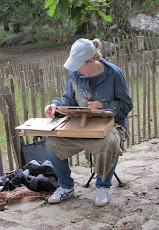 It is great fun and a wonderful place to paint. 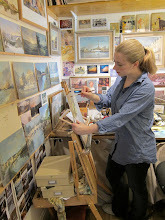 Instantly recognisable as 'Pirlots' valerie - excellent painterly work indeed! Thank you Peter! Glad you like them! 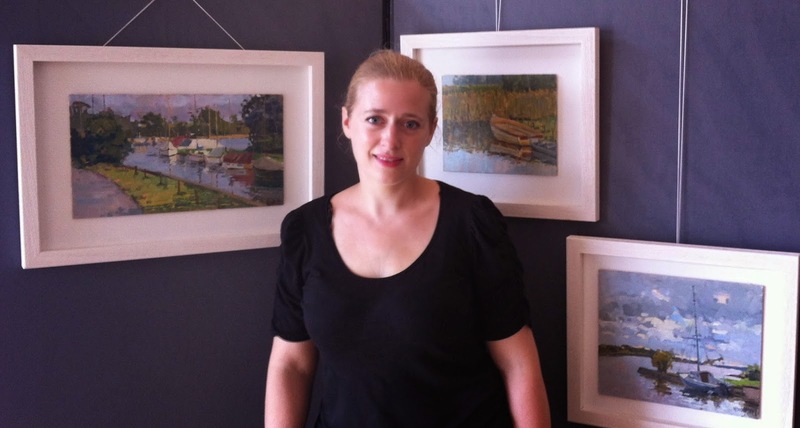 Amazing set of paintings Valerie, it looks like such fun! 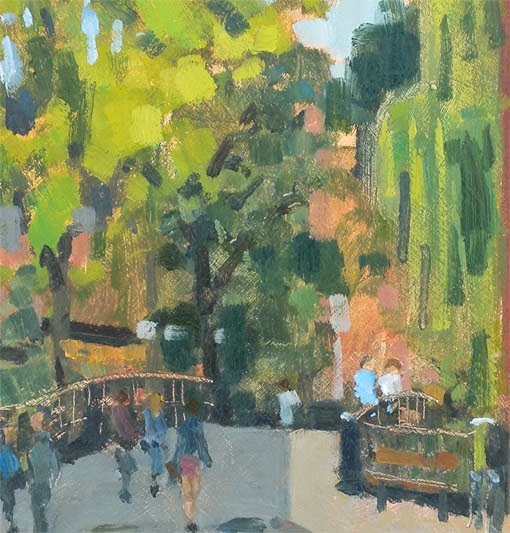 Me and Tom did a day Plein Air event with the Chelsea Framers in London on Saturday and it was very wet and very hard work but really enjoyed it. You should definitely think about doing one of their future events!